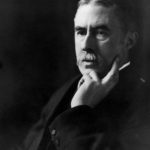 Alfred Edward Housman usually known as A. E. Housman, was an English classical scholar and poet, best known to the general public for his cycle of poems A Shropshire Lad. Lyrical and almost epigrammatic in form, the poems wistfully evoke the dooms and disappointments of youth in the English countryside. Their beauty, simplicity and distinctive imagery appealed strongly to late Victorian and Edwardian taste, and to many early 20th-century English composers both before and after the First World War. Through their song-settings, the poems became closely associated with that era, and with Shropshire itself. "I could no more define poetry than a terrier can define a rat."